There is a short list of reasons I will get up before 9 AM on a Saturday morning. A very short list. Of course, I wouldn’t be a food blogger without a few of those having to do with food (e.g. beating the dim sum crowd), and I’ve just added “Taiwanese food tour” to that list. 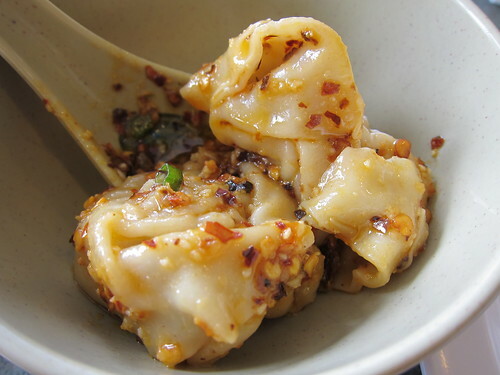 So if you choose the “Delicious Dumpling” Six Taste food tour, be prepared that Arcadia is where you’ll have to drive on a weekend morning – but you can rest assured that the trip is well worth it. You won’t have to get in your car again until the conclusion and when you do leave, you’ll be properly sated as you depart (unfortunately, this does not apply to vegetarians). Arcadia is the 3rd largest Taiwanese population outside of the native island, with San Marino to the north being the 2nd (meanwhile, my own Taiwanese parents decided on Wisconsin). As always, it’s best to go to the source, or at least where a majority of ex-pats migrated to from the source. Krista (Brand X), Marian (Marian the Foodie), Cathy (Gastronomy Blog) and I started out at J.J. Bakery, guided by Arcadia native Michael, our tour guide for the morning. We learned about common characteristics of Taiwanese pastries. Then, we moved on to the notorious Din Tai Fung, the definite focus of the tour. 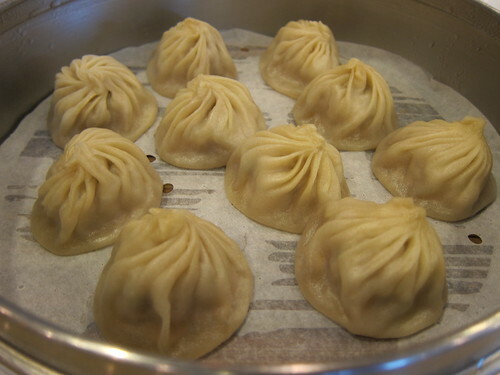 The Taiwanese dumpling chain known for their delicate skinned pouches filled with soup and pork rarely disappoints. Michael showed us tea etiquette and how to properly eat our shiao long bao, by poking or biting a hole into the dumpling and pouring out the soup onto our spoon. 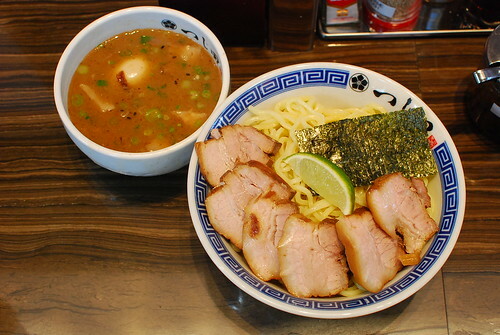 No soy sauce – just black vinegar and ginger – should accompany the bite-size dumpling. Afterwards, we walked to the neighboring plaza to try out SinBala, so-named after the chantings of a Taiwanese dice game. 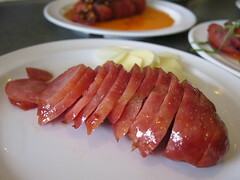 Here, we tried Taiwanese sausages with various dressings, like traditional garlic slices, shredded basil and mango. We also tried chili wontons, an oyster pancake (a common Taiwan night market treat) and fried pork chop. Most were not too keen on the oyster pancake (in fact, I like the egg runnier than it was prepared) but the sausages and the wontons went over well. Our last stop was a goods shop that shared a space with a Lollicup bubble tea store. Beef jerky and dried foods were stored in bins and we were free to taste anything that so pleased us. It reminded me of my last trip to Taiwan, when we visited a Hakka village with tons of dried goods. Preserved and pickled goods were made very popular when food was scarce since they were made to last longer. 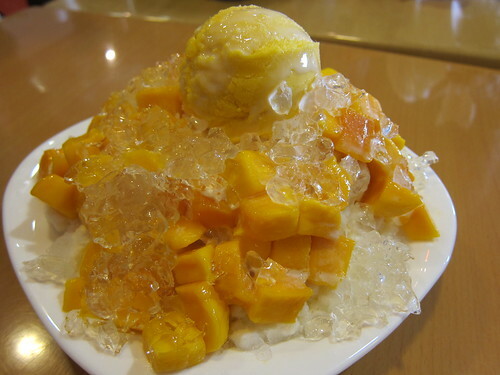 To close out the tour, we of course had some Taiwanese shaved ice with condensed milk, mangos and ice cream. It was definitely a treat – though it raised questions about the fluffier shaved snow. That will have to wait until our self-guided Taiwanese tour that a few bloggers and I will inevitably do another Saturday. 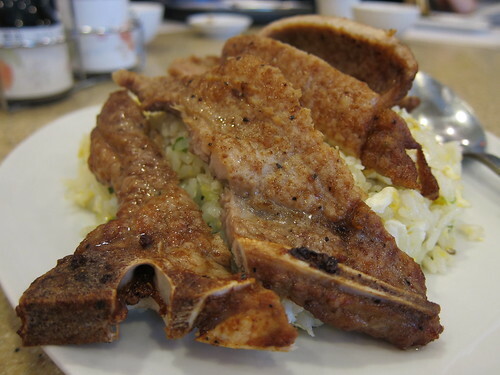 Though I’m Taiwanese in blood and have visited the Motherland enough times to count on both hands, I still learned a lot on the tour about Taiwanese food and community in Southern California (not being fluent or literate will stunt things in that area). Six Taste also conducts tours in so many other areas of Metro LA, with the Taiwanese tour being the east-most based tour. For the uninitiated, with visitors and residents alike, it’s a great way to get shown the ropes on the neighborhood you’re most curious about.